Protect your live stream by setting a threshold email alert. 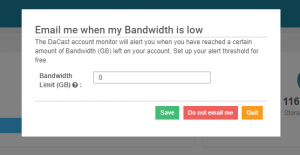 The DaCast account monitor will send you an email alert when you reach a certain amount of Bandwidth (GB) left on your account. 1/ How to set up an email alert ? Note : This number must be a round number. Your limit is set up ! You will receive an alert email when you will reach it. 2/ How to stop receiving emails? Go to “Upgrade my plan” and click on “email me when my Bandwidth is low”. Click then on “Do not email me”, and you won’t receive email alerts anymore. 3/ Does my limit value change if I upgrade, downgrade, cancel or if I get suspended? Nothing changes. Changing a plan, cancelling it or suspending it won’t change the limit value. 4/ What is my limit value per default? Per default, there is no limit set up. You can check it by clicking on “email me when my Bandwidth is low” and see the value per default. If 0, no limit set up. You won’t receive an alert. 5/ I have a limit default value, why? DaCast set up a limit value for plans existing before 11/13/2018 to keep on alerting existing customers who were used to receive a Bandwidth consumption alert – You can modify the limit anytime.